Shrouded in overgrowth and known only through frightening tales whispered around campfires, these ruins have stood empty of habitation for untold centuries... or have they? No Game Master wants to waste valuable time drawing every crumbing step and weathered statue. Fortunately, with Paizo's latest Pathfinder Flip-mat, you don't have to. This line of gaming maps provides ready-to-use fantasy set pieces for the busy Game Master, Full of beautiful details, this double-sided map makes the perfet settng for a delve unto an abandone temple or a battle with a forgotten cult! Don't waste yout time sketching when you could be playing. 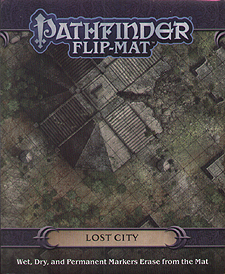 Withpathfinder Flip-Mat: Lost City, you'll be prepared next time your players find their way to perilous ruins.